2nd First Look: The Ethereal "Icebook"
Maybe it’s because I’m surrounded by children every day and am kept close to pure, unrestricted imagination, but I’m always drawn to art that has quirky, even magical qualities. Luckily, I’m fortunate to be surrounded by some grown-ups who are generous with their wonderful imaginations too, and often share the captivating art that they create or find. It was through this sharing that I was introduced to the Icebook, a stunning miniature pop-up book theater created by husband and wife team Davy and Kristin McGuire. 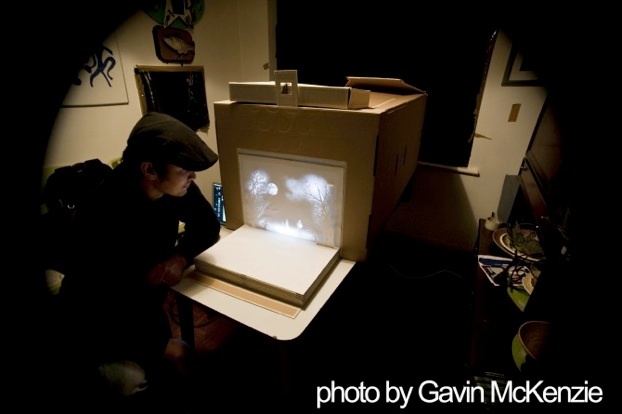 Davy dreamed of creating a live performance with scenery that would mimic a giant pop-up book, so he and Kristin went about designing a book-size demo model that they could show to prospective investors or anyone else interested in furthering their live theater idea. Not having created anything like the demo model before, they went through a long process of trial and much error. Kristin experimented with making the pop-up images, and after holding one up to a lamp one day and seeing the effect the light and shadows had on it, the current Icebook project took shape. While Kristin continued to cut out and sometimes draw the paper backgrounds herself, Davy focused on the projection aspects. Using themselves as actors against a rudimentary green screen, these images, along with film footage that is back-projected, were meticulously pieced together to create the charming animation in the film. Compositing - The Ice Book from Davy and Kristin McGuire on Vimeo. The result is an enchanting miniature show that has been showcased in Ireland, England, and Holland. It will be in Scotland next year, and is available for screenings at other events as well. Visit the Icebook website at http://www.theicebook.com/Home.html to read much more about the fascinating process behind this project.